Was PayPal cut out of Apple Pay because of Samsung partnership? Alongside the iPhone 6, iPhone 6 Plus and its eponymous smartwatch, Apple used its September event in Cupertino to reveal Apple Pay, its digital wallet technology. Like with Apple CarPlay, there were plenty of third parties ready to integrate the technology. PayPal, however, was not among them. A curious decision given PayPal's standing in the e-commerce market. Even more confusingly, reports from earlier in the year suggest the two companies were primed to collaborate on Apple Pay with PayPal even willing to white label parts of its payment service. According to a report published by Bank Innovation, Apple decided to sever collaboration with PayPal when the latter cuddled up to Samsung and its newly-released Samsung Galaxy S5. The partnership between PayPal and Samsung lets you use the handset's fingerprint scanner to authorise payments. Apple, it appears, was not best pleased with this turn of events and elected to bring Stripe, an online payments startup, into Apple Pay instead. Bank Innovation further claims that PayPal president David Marcus was against the Samsung partnership for exactly this reason, but was overruled by eBay CEO John Donahoe. What makes this even more intriguing is that news has just emerged that eBay will spin PayPal off into a separate entity in 2015. Whether a future partnership will take place in light of this remains to be seen. 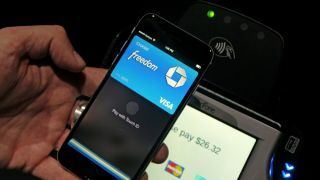 But Apple isn't hanging around; Pay will roll out later this month in the US with 220,000 retail locations supported, along with major credit card networks like Visa, MasterCard and American Express. We've approached PayPal for a comment on the report and will update this as soon as we hear back.